Green, affordable, and easy to get around, Portland, Oregon will appeal to casual couples on a honeymoon or romantic holiday who want the conveniences of a city plus the pleasures of the outdoors. Nature is never far away; count down the blocks as you stroll to the Willamette River waterfront esplanade. 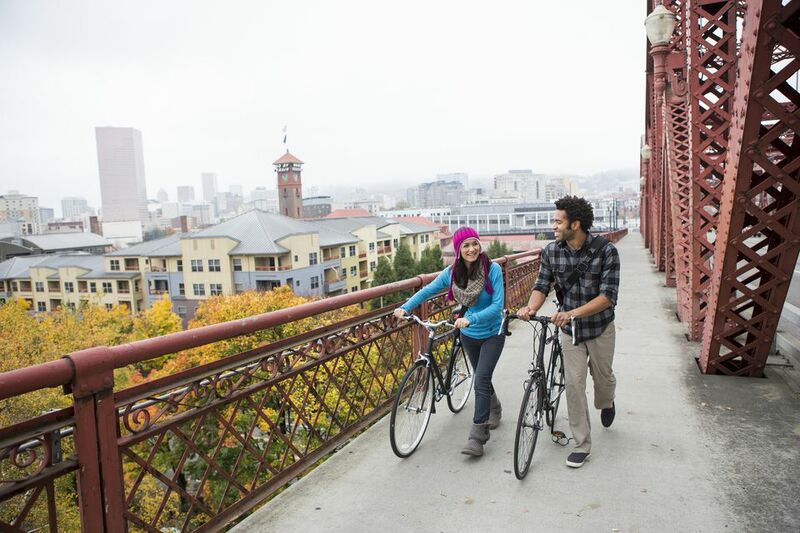 Rent a car or bikes and head to nearby Mount Tabor or Multnomah Falls. And as befitting a truly romantic destination, there are three exquisite gardens in Portland, Oregon where people in love can literally stop and smell the roses. There's a reason Portland is called the Rose City. Its mild, misty weather is the ideal climate for romantics' favorite flower to bloom. Portland has three major rose gardens: The International Rose Test Garden is a place to marvel at the variety of new hybrid species cultivated here. It contains more than 10,000 plants, and the best time to view them is between June and mid-October. Weddings are permitted here. The serene, 5.5-acre Japanese Rose Garden is a place for reflection. It's composed of five distinct garden styles, each designed to instill a feeling of peace and tranquility. Lan Su Yan, Portland's Classical Chinese Garden, occupies a square block in the city center and features an enchanting teahouse. An extinct volcano on Portland, Oregon's east side, Mount Tabor is now a park that provides a perspective on the city. (Pick a clear day to peer through the thick foliage.) Hiking trails lead to the summit, and romantic couples can find places of solitude to kiss. Birding is a popular activity; couples who can tear themselves away from gazing into one another's eyes may spot jays, crows, swallows, chickadees, sparrows, orioles, blackbirds, finches, and the love-song serenades of thrushes and warblers. Mount Tabor can be reserved as a wedding spot. A sprawling, French Renaissance-style château completed in 1914, Pittock Mansion stands 1,000 feet above Portland in the West Hills, offering another picturesque aerie for landscape lovers. Tour the house built by tycoon Henry Lewis Pittock and his wife Georgiana, who had a love of architecture, design, and the outdoors. Portland, Oregon's artisanal chocolate scene is where coffee was 15 years ago. One of the city's best-known chocolate purveyors, Cacao has two locations, one beside the Heathman Hotel lobby. Since there's no denying here that chocolate is an aphrodisiac, romantic couples can sample local and imported bars, choose handmade chocolates and caramels (a sprinkling of coarse salt brings out the flavor of the latter), and drink Cacao's ambrosial liquid chocolate. Portland's famed donuteria, Voodoo Donuts is original with flavors you won't find anywhere else. Delicious selections include Voodoo Doll (filled with raspberry jelly topped with chocolate frosting and a pretzel stake), the legendary Bacon Maple Bar (maple frosting topped with two crisp pieces of bacon), and Triple Chocolate Penetration (chocolate cake doughnut with chocolate frosting topped with coco-puffs). Love doughnuts as much as each other? You can get legally married inside the Voodoo Doughnuts shop in Old Town. The website details the various wedding packages available. Voodoo Doughnuts' owner is an authorized if offbeat officiant. What's a doughnut without coffee? Stumptown, with multiple locations throughout Portland, is the established name among Oregon's indie coffee roasters. In many shops, you can linger romantically over a cup of limited-edition, hand-roasted, fair-trade coffee. Cascading down 620 feet, Multnomah Falls is the second highest year-round waterfall in the United States. A half-hour drive from Portland, it's located on the Oregon side of the Columbia River Gorge. A paved trail leads to Benson Bridge, which spans the falls and provides a dramatic view. Afterward, pause at the Multnomah Falls Lodge for a snack, a souvenir, and a pit stop. Less than four miles away, Bridal Veil Falls also rushes down the Columbia River Gorge, but from a less dramatic height. The local post office is a popular stop for couples mailing wedding invitations. Food carts (tiny trailers on wheels where food is prepared) dot downtown Portland. Whether your taste runs to ethnic, hearty, healthy, or another type of fare, it's likely you can find a food cart vendor who will prepare a dish to your liking. Cheap, fresh, and handmade, food cart food is Portlanders' first choice for Mexican (and every other type of cuisine) in the city. Oregon's climate is as salutary for grapes -- particularly pinot noir -- as it is for roses. Stretching south from Portland, the Willamette Valley is home to some 200 winemakers, and most feature a tasting room. And these are not boxy little areas: Many have well-designed outdoor spaces with views almost intoxicating at their wines. Save on dinner by savoring a happy hour meal. Grazing on smaller portions with inventive flavors for a few dollars a plate and opting to drink a house wine, local brew, or daily cocktail specials will help romantic couples on a budget to stay within their limit. Located on the south side of Mount Hood, about an hour's drive from Portland, Timberline Lodge is a National Historic Monument surrounded by 60 miles of pristine forest. Originally designed to be a mountain retreat with a ski lodge, it attracts some two million visitors a year in all seasons. Romantic couples may want to stay overnight in this WPA masterpiece, where furnishings are artisan-made. Depending on the season, the resort offers downhill and cross-country skiing, snowboarding, hiking and mountain biking, music festivals, dining, and shopping. Befitting its scenic setting, Timberline Lodge is available for weddings and can provide catering services. For a breath of fresh air — and a great city view — head up to the 15th floor of The Nines hotel, the most stylish in Portland, Oregon. It's where the Departure lounge is located. Sit outside and canoodle on a comfy chair or couch and have a drink or dine (the menu is Asian-fusion) overlooking the Portland skyline. When it's chilly or too rainy for you, cozy up to the bar inside. A Portland institution, Powell's Bookstore contains about a million volumes in nine rooms and 3,500 sections. A city block long and also a full block wide, it's the largest used and new bookstore in America. Fortunately, they hand out a map at the entrance so if one of you loves memoirs and the other strictly reads thrillers, you can arrange to reconnect at an agreed-up spot later. Daily hours are 9 am to 11 pm, so if you're more akin to bookworms than club kids, you can dally here till late. Is there any activity more romantic than a wedding? Portland makes about 180 of its parks available for outdoor ceremonies. You'll need a permit and to pay a fee, but you can choose from gardens, picnic sites, and leafy expanses. If you're not ready to get serious, head to Old Town's Church of Elvis. You can't get legally married at this storefront art installation, but for chump change, you'll get some giggles and can have your fortune told.